I’m not sure this is worthy of “news” necessarily, but it’s definitely got some neighbors talking (campsite picture on right is from a post on the CC Facebook page) and I figured it was worth a quick post. 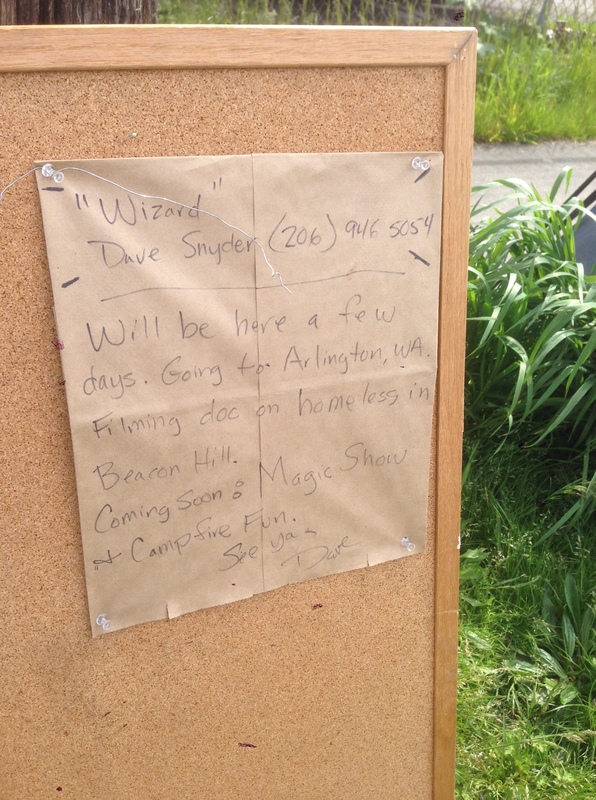 A man (Dave “Wizard” Snyder) has set up camp on the parking strip across from the Soreano’s Plumbing lot on 47th and Ferdinand. For a few days, he was set up in the empty lot at 35th and Hudson (across from the Greenhouse), but apparently has moved on one block to his current location. His “camp” is pretty established: rugs, a tent, a message board, clotheslines, cushions, etc. Having interacted with Dave directly, (he once walked by and filmed some flowers in our yard and later invited the family to some kind of magic show) he seems pretty harmless–definitely a talker, definitely creative….according to the note posted at his campsite, he’s filming some kind of documentary on the homeless of Beacon Hill. A few neighbors have also contacted the SPD’s non-emergency line to report the situation. At least one has heard back that, technically, nothing illegal is happening and not much can be done by the police (if anyone can clarify how that’s the case, be sure to chime in). I walked by as the police were talking to him yesterday and heard a cordial conversation asking him politely to pack up. So far, he’s been in the neighborhood for about a week. His message (see picture on the left) indicates that he should be travelling on fairly soon. Different guy. Saw him this weekend. He seems to pack up and leave in the AM. is it not against the law because its not on someones actual property?? 2 cops were there this morning to talk with the guy. He was not in his tent. I spoke with the cops and asked if there was anything they could do. They said they will talk with him to try get him to move on. They also said they will try to find ‘something’ he is doing illegally to get him to move on. They agreed it was an ‘eyesore’ and ‘inappropriate’ in a neighborhood setting. You aren’t allowed to erect structures on a parking strip. Beyond that he’s probably ok.
He’s still around, stashing his stuff between Ferdinand and Hudson. He’s got a shopping cart piled high in front of the new construction on Hudson. Still has his tent up on Ferdinand. I don’t think he’s got any plans of moving anytime soon. He’s accumulating more and more stuff. I chatted with him briefly this morning. He said he is not leaving Columbia City but plans to move just up the hill toward Hitts Hill. It may be helpful to fill out the illegal dumping report for city follow-up. Definitely not legal to takeover part of the right-of-way without an SDOT permit. Find the “service request form” at this site and then you’ll see “illegal dumping” as a choice. Just did…thanks for the link, Scott. Just got a call from the city. Apparently a number of us reported this. They seem to be on it. They said that they will post a notice that he’s in violation which gives him X amount of time to move on. I think if we continue to pressure the city and the SPD, he will be forced to move (and hopefully not just up the hill to a new location). I wasn’t too concerned about this until I passed the mountain of beer cans on my way out today. Ian, if you saw that, please call the police’s non-emergency number (206) 625-5011 and report it. SPD is looking for any way to get this guy to move on. Pretty sure you can’t pitch a tent and start drinking on public property (although apparently the tent part is no problem). 3 cops are there now talking with him. looks like they are trying to reason with him and get him to move on..
Looks like he is starting to pack up. Tent is down…still quite a bit of stuff, though. Just before 7 this morning there were about 3 cop cars at Hudson and 37th. Now this guy (or pair if you count who think is the camera guy) have most of their stuff on the small vacant lot. There’s still junk back at Ferdinand and 37th. At least the Dawson intersection was cleaned up a couple days ago. I’m pretty sure the owner and residents of Greenhouse apartments (let alone other nearby residents) aren’t going to put up with so much junk strewn about. I’d like to know if the property owner was consulted before he moved there. Now it’s DPD jurisdiction. Great. Now it looks like he might be actually moving into the traffic circle at 37th and Hudson–at the least, he’s stashing some stuff there. I can’t believe how much he’s accumulated over the past two weeks. Greenhouse residents: make sure you get in touch with your apartment manager (or whoever sits at that front desk all day). They might be a good resource to tap into and let them really hammer the city and SPD about getting this guy to move on. Also: might be a good time to reclaim that traffic circle–clean it up, plant a tree, do some landscaping, etc. Hard to argue against the WIzard when he’s just setting up in some weeds. Might have had something to do wit the bonfire in the middle of the street last night that I called in (I live in a corner unit facing the intersection). Being no stranger to neighborhood oddballs, I can’t help but feel a bit prudish making waves about the situation, but at the same time It’s not exactly fun having to climb over a tent and garbage to get home at night. He talked to me briefly this morning and told me he was creating ‘street art.’ I guess that is a matter of his opinion. Had a chat/confrontation with him (nothing major…he accused me of thinking that “I own the street” and that all “the rich people in the neighborhood are ignoring the homeless”). In short, he said he was leaving. Police happened to show up about 5min later. As of now, he appears to be gone. At the least, the vast majority of his stuff is gone… although he did leave behind quite the mess. We will see what the situation is in the AM, but it does appear that the Wizard might have finally left the neighborhood. He’s gone. I took the mess that he left on 37th and Hudson (which was quite a bit) to the dumpster. He does have his two shopping carts stashed behind the Esmay building, though…still full. I’ll fill out another report with the city for illegal dumping. Talking to a few other neighbors this weekend, it looks like the police were called multiple times on him–there was even a report of some kind of physical altercation that took place with another CC resident he had been hanging out with for the past few weeks. Thank you for cleaning up his mess. It looked pretty bad yesterday. I appreciate your help to keep our neighborhood clean. Does anyone know if this guy is still around somewhere near Columbia City? I’d like to speak to him.